HTTP/2 provides two methods to prioritize streams (e.g. files being served). One method is called weight-based prioritization. In weight-based prioritization, every stream is given a weight, and the value is used by the server to proportionally distribute the bandwidth between the streams. As of this writing, out of the two popular web browsers that implement HTTP/2, only Firefox uses dependency-based prioritization. Note: the background section has been rewritten due to the fact that the comparison with SPDY turns out to be wrong, as pointed out in the comment. The original version of the section is here. Rest of the blogpost stays in tact. Below is the network time chart generated by Firefox 37.0.1 when accessing a sample web page3 (given 100ms network latency6) containing a number of CSS, script files, and images. H2O version 1.2.0 was used as the HTTP/2 server for running the benchmark. 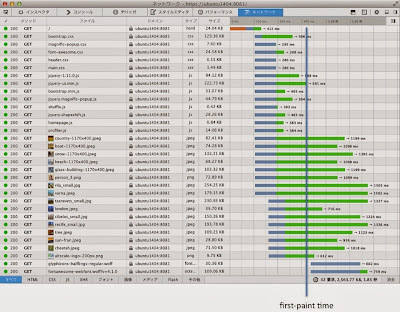 By looking at the chart, you can see that many CSS, script files and images are requested in parallel at some time around 320ms, but that the download of files that block rendering (e.g. CSS and script files) complete before any of the images (even the smallest ones) become available. This is due to the fact, as I explained earlier, that Firefox notifies the HTTP/2 server that HTML and image files depend on the CSS and the script files to become rendered; therefore the server is sending the files being depended before sending the dependents. And thanks to the prioritization, all the files that are required to do the initial rendering arrives at the web browser (a.k.a. first-paint time) at around 1.0 seconds from start. On the other hand Chrome's prioritization logic only uses the weight-based prioritization; the logic remains mostly same with that used in SPDY. Chrome assigns a predefined weight to each of the stream based on their types. And here is the timing chart taken using Chrome (version 44.0.2371.0 canary) when accessing the same web page. Unlike Firefox, CSS and script files are not arriving before the image files. If you look carefully, you will find a vague relationship between the size and the arrive time of the contents independent to their types. This is because each of the files are interleaved into a single TCP stream based on their weights, and because of the fact that the weight between the files do not differ much. Therefore the initial-paint time is as late as 1.5 seconds5. As shown, dependency-based prioritization introduced in HTTP/2 brings non-negligible benefit in terms of web-site performance. In case of the benchmark, Firefox using dependency-based prioritization was 1.5x faster than Google Chrome only using weight-based prioritization when comparing the first-print timings. My understanding is that the developers of Chrome is aware of this issue, so hopefully it will be fixed soon. I also hope that other web browser vendors will utilize dependency-based prioritization. As shown, it is clearly the way to go! PS. And it should also be worth noting that HTTP/2 servers should implement the prioritization logics correctly. In case of H2O, the server both of the prioritization logics are fully implemented using a per-frame weight-based round robin with the frame size of 16Kbytes at maximum. note 2: ref: nsScriptLodare.cpp line 306; I am not sure if this is the intended behavior, IMO script tags in BODY should given a priority equiv. to HTML or image files, and it might be the case that the condition of the if statement should be reversed. note 5: the network chart of Chrome includes a 0.2 second block before initianting the TCP connection, which has been subtracted from the numbers written in this blog text. note 6: An Ubuntu 14.04 instance running on VMware Fusion 7.1.1 on top of OS X 10.9.5 was used for running the server. Network latency was given using tc qdisc command. Both the web browsers were run directly on OS X 10.9.5. Slight correction. 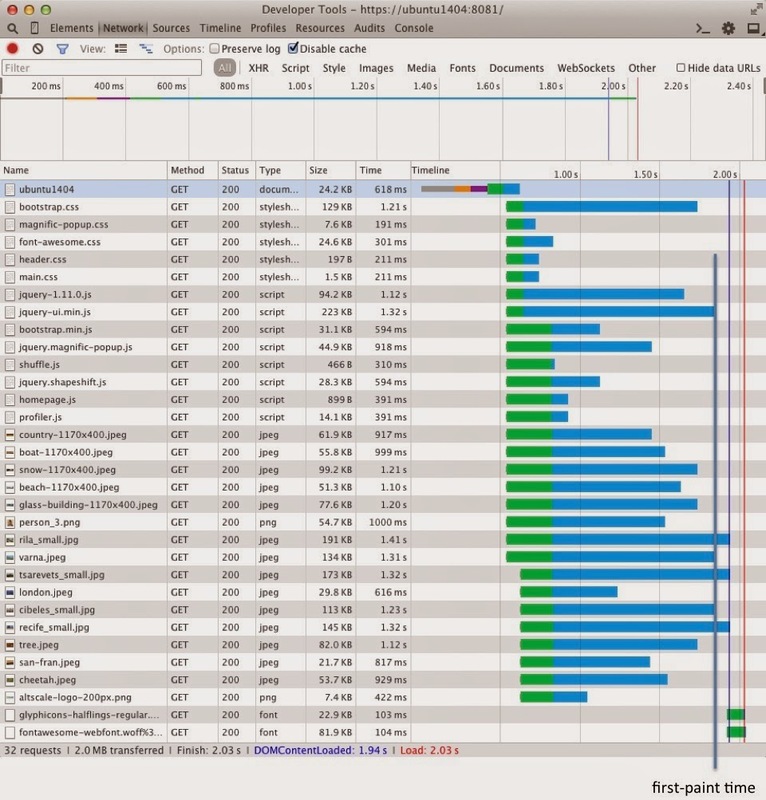 SPDY priorities were similar to dependencies in that higher priority streams were to be delivered before lower priority streams ( https://www.chromium.org/spdy/spdy-protocol/spdy-protocol-draft3#TOC-2.3.3-Stream-priority ). It was only in HTTP/2 that the priorities became weights. Thank you for the correction. I had thought that the priorities in SPDY is weight-based since in Chrome they are mapped to weights of HTTP/2. If that is the case, is my understanding correct that Chrome actually becomes slower by switching from SPDY to HTTP/2 in terms of first-paint time, in case of viewing a web-site like the one explained on this blogpost? Correct, at least until Chrome moves from using weights to HTTP/2 dependency groups. I hope Chrome would get updated so that it would work better with HTTP/2. Meanwhile I might add some tweaks to H2O so that it can provide better experience to the users of Chrome. I will also update the blogpost to reflect your collections (I've already updated the background section). Thank you very much for your help! There are so many areas of software development and online services available today that many people feel that they have to hire professional web design services, it is essential. Objek wisata gunung bromo menjadi primadonya jawa timur karena wisata ini memang sangat fenomenal di kalangan para wisatawan. Banyak para pengunjung yang datang dari luar negeri untuk menikmati keindahan alam di wisata gunung bromo. Hamparan pasir yang luas dan dinginnya hawa pagi di wisata gunung bromo menambah keseruan saat berlibur ke wisata gunung bromo jawa timur tersebut. Pelayanan jasa sewa mobil malang murah sangat diburu oleh para wisatawan yang sedang berlibur di kota malang batu. Jasa sewa mobil murah malang ini bisa menjadi ladang bisnis yang menggiurkan, karena mengingat banyak para wisatawan yang datang dari luar membutuhkan transportasi sewa mobil malang murah. Beragam pilihan paket sewa mobil malang murah dan juga bermacam-macam tipe mobil yang disediakan oleh sewa mobil malang batu murah. Informasi pemesanan dan booking online sewa mobil malang murah baca halaman lengkap. Racikan ampuh jamu kuat dan tahan lama yang dapat dengan mudah mengatasi masalah ejakulasi dini adalah dengan memakai ramuan herbal madura. Obat kuat yang berasal dari madura sangat populer di kalangan pria yang menginginkan hubungan seksual tahan lama agar bisa menikmati kenikmatan saat berhubungan intim tersebut. Jamu tahan lama seksual ini diolah menggunakan bahan-bahan tradisional dan sudah terdaftar resmi di badan kesehatan republik indonesia. Jadi anda tidak perlu khawatir saat mengkonsumsi jamu kuat alami dari madura ini, tidak ada dampak negatif sedikitpun bagi kesehatan tubuh. artikel terkait . Harga jual jamu kuat dan tahan lama produksi ramuan madura asli obat kuat tahan lama. Love to visit your blog again. Home designer pro a software that can work. Hadirnya Agen Togel Primbon Online untuk para pemain togel online di indonesia ini untuk membantu Anda semua agar bisa bermain secara Aman dan Nyaman. Seiring berjalannya waktu kami akan terus menerus meningkatkan pelayanan kami dalam taruhan togel online agar semua member yang bergabung di Primbononline.com merasa Puas dan Bahagia. Diskon Togel Besar dan Bonus Terbesar kami sediakan secara khusus untuk para pemain togel di indonesia agar tetap merasakan keuntungan dalam melakukan judi togel di Primbon Online. Hanya di Bandar Togel Terbesar Primbon Online yang memberikan Diskon Togel paling besar. Mentariworks adalah situs judi online dan juga Bandar Bola Online terpercaya yang sudah berdiri di Indonesia sejak tahun 2012 sampai dengan saat ini. Dimana sudah mempunyai ratusan member aktif setiap harinya, hanya dengan minimal depo 50 rb dan minimal wd 50 rb para pecinta judi bola online sudah bisa bergabung dan ikut bermain di Mentariworks. Thank you so much. This is what I want to know more about.